NOTIFICATION OF GPS JAMMING TRIALS – NORTH SCOTLAND 16-27 NOVEMBER 2009.The purpose of this Circular is to give notification of the trial to be performed by the Ministry of Defence (MoD) Air Warfare Centre, in which Global Positioning System (GPS) signals will be intentionally jammed. Date: 16-27 November 2009.Time: A maximum of 6, fifteen minute periods between 1100 and 1500.Location: The trial uses a 500 Watt airborne jammer at 10000 ft amsl, transmitting to the west along a 50 nm flight path on a 270° T radial from Kirkwall, Orkney Islands. 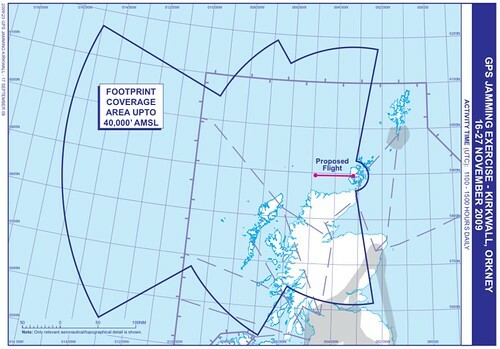 The aircraft will fly between two points, situated at a distance of 10 nm and 60 nm from Kirkwall. Infrastructure is only noticed when it’s not there. Failure, simulated or not, is sometimes the only way to remind us what we smother ourselves in. Tomorrow: leaving my phone at home.